How Do I Care for a Baby Swallow Bird That Fell From Its Nest? If a bird is capable of hopping, a shoebox will not work. Create a vinyl mesh cage or purchase a picnic net shield to contain them. Do not place baby birds into an aquarium as they can become dangerously hot or humid. Do not peer down at the baby bird like a predator or over handle it, as this is very stressful to a bird. If a bird is injured, take it to a veterinarian immediately. Change bedding when it gets dirty or damp. Maintain a steady temperature for the bird and keep it in a quiet place. Once a bird is hopping up or sitting on your finger perches should be added to the enclosure. Although it is always best to return a fallen baby bid to its nest, sometimes it's just not possible to do so. It is also best to leave the bird alone for an hour or two if it is in a safe area — possibly in a basket hung in a tree — because the mother may come to rescue it. Whether a bird can be saved at that point depends on how long it has been away from the nest and if it was physically injured before or after the fall. When possible a baby swallow should also be kept in outdoor temperatures, such as on a porch. Place a small bowl into a shoebox. Line the bowl and box with shredded paper towels so it resembles a nest. Gently place the baby bird into the bowl. Cover the box with a large plastic weaved basket or box to protect the bird and keep it from wandering. Be sure the weave is tight enough to keep the bird from squeezing through. Extract a small amount of the baby bird formula into an eyedropper. Place a drop on the swallow's beak. It may take a while for the bird to accept the formula, as it will be fearful and possibly very weak. It may take up to a day for the baby to actually take much in, but the bird will eat more as it gains strength. 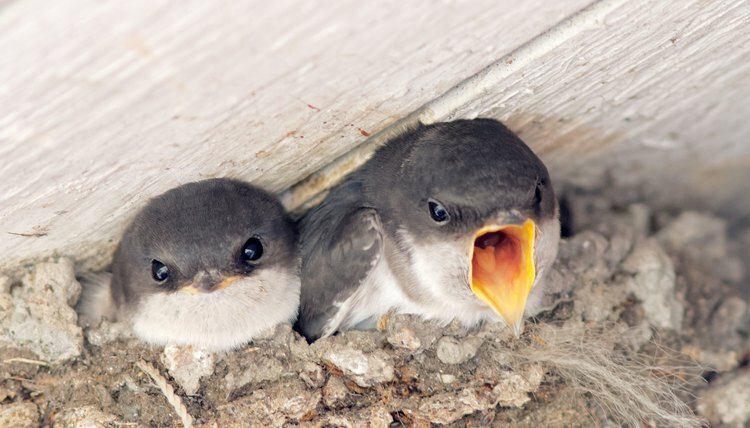 Feed the baby swallow every two hours during daylight hours. Someone should be with the bird all day. Put a dab of room temperature canned kitten food on your fingertip and hold it out to the swallow once it is strong enough to accept food this way. Add small insects to the swallow's diet as well. Insects can be found near outdoor lighting fixtures at night and should be dead when served to the baby swallow. Wild Bird Watching: Baby Birds - Should I Help?